America is transfixed by the Trump circus. But with little notice, the Koch Brothers are getting stronger. Their decades-long quest to reorient the economic philosophy of the Republican Party and allied organizations to an extreme, anti-government Libertarian philosophy that benefits their own interests is working. Now they have attained control of 16 executive branch departments through appointments of cabinet secretaries and agency heads with long standing ties and financial support from the Kochs. To learn more about these 16 officials, click HERE or on the image at the top. Over 18 months, Checks and Balances Project conducted an in-depth investigation into both Koch Industries and what we call the Koch Advocacy Network. The bottom line is that Koch Industries acts continuously to protect and grow its business, and the Koch Advocacy Network is designed to protect and grow Koch Industries. The Koch family, primarily Charles and David, obtained more than 80 percent of the common stock of Koch Industries and 88 percent of its voting stock following the buyout of dissident shareholders in 1983. Although the Brothers own major oil refineries and thousands of miles of pipelines, their company make most of its money by transforming raw fossil fuels into usable goods. Koch Industries is the second largest private company in the U.S., with more than 120,000 employees in about 60 countries. Annual revenue was estimated at $115 billion in 2015. According to the Bloomberg Billionaires Index, Charles and David Koch are together the two wealthiest people in the world, with a combined fortune of $96 billion. For years, the Koch Brothers have been working to secure political dominance in the states. But since Mike Pence was selected as Donald Trump’s running mate, a new world of opportunity has arisen. When he recommends individuals for major jobs in the Trump Administration, as he did consistently as the chosen leader of the transition, and to this day in his role as Vice President, Koch strength increases. Mike Pompeo, Central Intelligence Agency Director: In the Republican Wave election of 2010, the greatest beneficiary of Koch Industries largess was newly elected Congressman Mike Pompeo. After his election, Pompeo has been referred to as the “Koch Brothers’ Congressman” and “the congressman from Koch.” A former member of the House Intelligence Committee, Pompeo was chosen over 20+ other members of the House and Senate intelligence committees to become CIA director. Tom Price, Secretary of Health and Human Services: As a Congressman (GA-06), Price’s support of the positions of the Koch’s primary political organization, Americans for Prosperity, were 95% in 2007-2008; 100% in 2009-10; 91% in 2011-12; 77% in 2013-14; and 100% in 2015. In 2016, his rating by the Georgia Chapter of Americans for Prosperity in 2016 was 100%. 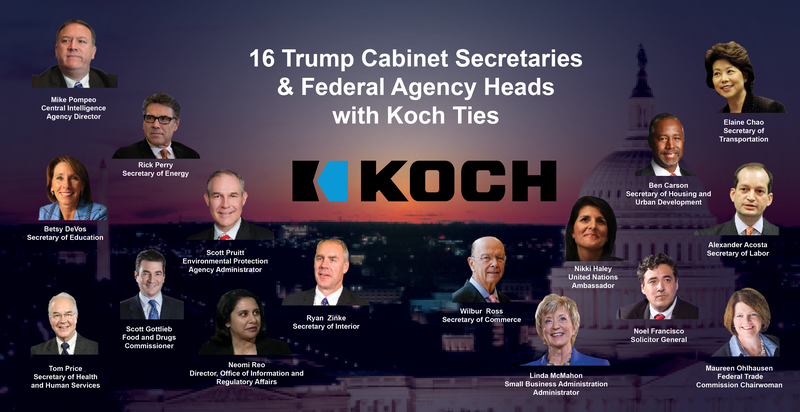 Neomi Rao, Office of Information & Regulatory Affairs Administrator: Ms. Rao is the Administration’s regulatory czar, directing an office of some 50 officials and reporting to another Koch Brothers’s favorite, Mick Mulvaney, Director of the Office of Management and Budget. Rao will outline the deregulation plan for each federal agency. She had been a professor at George Mason University’s law school for 11 years when she was selected in Sept. 2015 to create GMU’s Center for the Study of the Administrative State. GMU’s recently renamed Antonin Scalia School of Law is by far the largest academic benefactor of Koch charitable funding, receiving more than $46 million total since 2005. Our democracy has been hijacked by the two wealthiest brothers in the world, whose combined net worth is greater than Bill Gates. Never have so few controlled so much of our political system and our government. As Koch strength increases, their agenda is already being implemented.